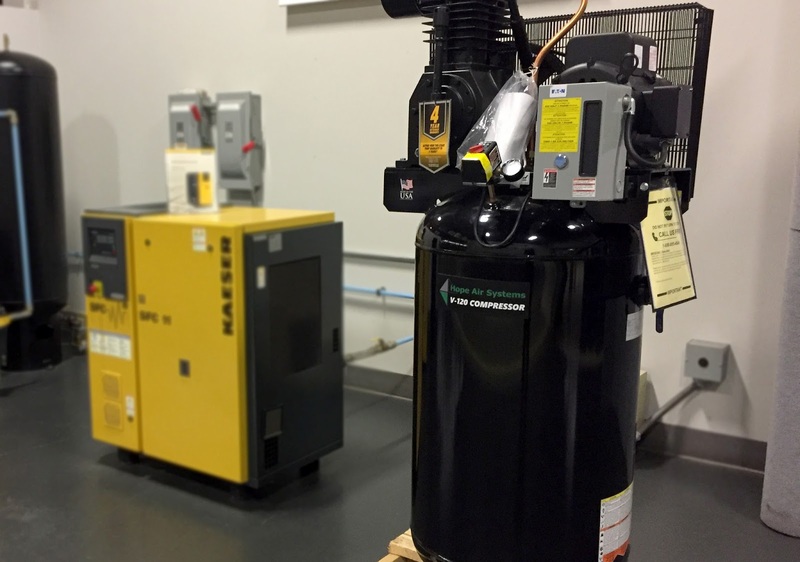 As you know, Hope Air Systems is a proud distributor of Kaeser and Champion Air Compressors. I am excited to announce we are launching our own line of industrial-grade reciprocating air compressors to add to our product line. The new Hope Air Systems’ stationary vertical or horizontal electric two-stage, belt-driven compressors deliver up to 33.6 CFM at a maximum pressure of 175 PSI and 35.0 CFM at 100 PSI. They are built for commercial and industrial applications and are equipped with an electric Baldor Motor (single phase and 3 phase available), magnetic starters, and cast iron pumps. The patented pump design provides for a cooler running pump. We are also offering gas engine (powered by Honda) and portable compressors. You can view our brochure (PDF) for details and pricing. Or, if you have any questions call me at 508-351-1827 or email me (hstjohn@hopeair.com). In the meantime, take a look at all our reciprocating compressors on our website! We all know that a pinched copper tube blowing onto a product is a really inefficient way of using compressed air. How bad is it? A 1/8 inch hole will flow 26 CFM at 100 psi, which uses at least 6 HP on your air compressor. If you run three shifts five days per week and pay $0.10 per KW, that little piece of copper blow off tube probably cost you around $2900 per year. Many blow offs have smaller openings than 1/8 inch. There are really three solutions out there to save energy and costs associated with air blow offs. #1 is to convert to a blower, which may not be feasible in some applications. #2 is to put a nozzle on the end of the tube to reduce the flow and the sound level, which works just fine but many of the nozzles disappear after period of time. #3 is to reduce the amount of air by changing or and inserting a control valve. Large reductions in air consumption. 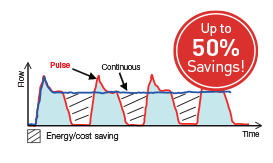 Savings in compressor power consumption. Reduction in plant CO2 emissions. Big contribution to energy-saving activities. When you consider that air blowing accounts for up to half of all compressed air used in plants, the potential energy and cost savings is considerable. In the example outline below, the application of Air Saver Unit valve on four nozzles with a one minute below per four minute cycle operating for three shifts, five days per week saved plant operators $3,500 annually. This is the only the tip of the iceberg for air conservation. To find out more about how to properly use this Air Saver valve and other energy conservation components click on the link below to register for the Introduction to Industrial Pneumatics seminar being held from 8:30AM to 12PM on October 20 at the Parker Store in Lewiston, Maine. Need a system engineer to look at specific air use problem in your plant? Please call Frank Lederer at 508-351-1817 or email: Frank Lederer at FLederer@HopeAir.com.